Was it a case of MSNBC being a little too eager to proclaim a Democrat candidate the election winner? Or was the network propagating “fake news?” Maybe they’re just plain incompetent? MSNBC made a major blunder when they accidentally aired the results of Florida’s gubernatorial race -horror of horrors- on the night before the election. Yes, they passed it off as election result, not a prediction. Perhaps it was just a case of a test misfire, consistent with the network’s “misfiring” notoriety of late. But some “dirty minds” may not be able to help but suspect if there’s a more sinister agenda behind that like, say, voters’ mind-conditioning perhaps? That is because as consistent with their alleged “bias”, their test ‘misfire’ had a Democrat candidate winning, of course. 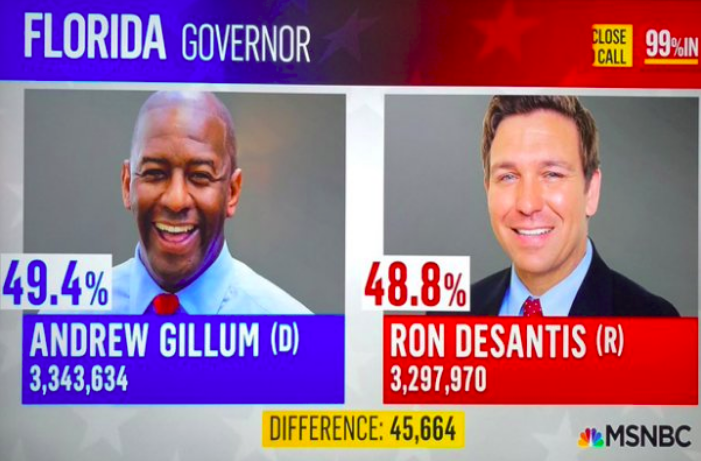 MSNBC put Democrat candidate, Tallahassee Mayor Andrew Gillum as the “winner” with “99 percent of the votes tallied.” The network presented their imagined scenario of Gillum securing 49.4% of the vote over his rival, Republican RonDeSanti’s 48.8%. It doesn’t really matter if polls for Florida’s gubernatorial race have been mostly trending in Gillum’s direction. Such does not absolve MSNBC’s gaffe of airing a supposed result the night before the actual election takes place. Unless they want to transition from presenting the news to playing fake Nostradamus and giving predictions they see from their crystal ball, they should really get their act together. They were obviously already loading their fake guns, to fire fake news bullets. This, to me, is nothing more than them blowing their cover and showing Demoncraps intent on trying to rig the elections, by having dims vote early, only to return today and vote again. All the reporting is screwed up and inaccurate. you cant trust any of it. SUCH LIARS!!! This is a deliberate misinformation campaign! They are trying to manipulate the public! They cant win so they are giving payback emotionally. Projections and calls are BS! !